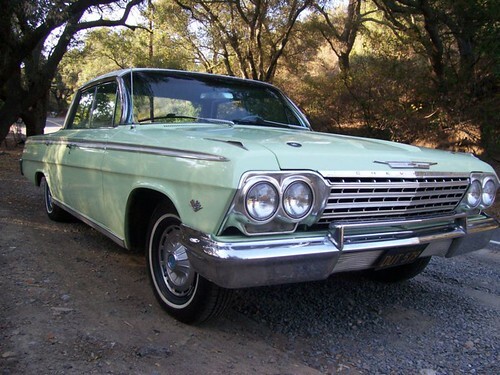 DECEMBER 2011 - My 62 Chevy Impala is for sale. Sad to say but she needs a good home. NEW 62 Impala Picture Gallery. 180 Images of my 62 Chevy Impala! The DIRECT URL is easy to remember and to share with friends - www.GregsImpala.com. Email Greg Vail or 714-915-8245 for message line - I will return your call! 62 Chevy Impala for sale with 120,*** original miles. -- WAS ASKING $18,500.00 >>> PRICE JUST REDUCED - MUST SELL! This is a steal of a deal! This won't last long at this price. Well under-priced for a Classic Impala Cruiser! Own a piece of American Culture from the 60's! And she is set to turn 50 in a few short years which will bring much more value to your investment. Runs great, sounds great, looks great but needs minor finishing touches for complete restoration. Rebuilt 327 Small Block top to bottom 9/10ths over, original Power Glide transmission with matching numbers, sounds and runs great. Headers run straight back with MagnaFlow dual exhaust for that classic big sound. 4 Door, no window divides makes it the ultimate cruiser, fresh Mint Green and White paint, standard rims with new white wall tires. All outer panels in near perfect condition. California car with black plates and dealer plate frame still intact. Big Plus - I have all original parts including factory air, carb., air intakes, ect... The trunk is full of original parts to be included in this sale! Original 2 barrel carb and very old 4 barrel carb, 327 air intake, valve covers, original air conditioning unit, manifold, headers, water bottle and holder, extra windshield wiper motor, small steering wheel, and more. Will not separate! All original parts from the rebuild are available with the car to the buyer. They say you can only have an original once, but this time you can have one again! Wind Shield wipers motor repaired or switch or wiring? She is a great looker as is! A recent trip up to Hollywood found my 62 Impala in front of the Beverly Hills Regent Hotel with the 6 figure luxury cars. I never had a car make the cool list like this before. You can buy this baby - thought to be important enough to be parked between a brand new Lamborghini and convertible Rolls Royce just a few months ago. Wish I had a camera that night! The paint job is nice. Lots of pictures! I took her out for a cruise with camera in hand and got a lot of great pictures! Two tone - Green with White hardtop and strip down the side with White wall tires - very pretty! It came with original paint in 1999 and had the surface rust sanded out and she was painted White. (Seen on Wisdom from the 62 Impala - Down the page.) She had original everything when I bought her and had been sitting for years. She was owned by a woman in Central California, who passed away, and the car sat in the yard for 15 years. A friend of mine bought the car for his daughter, did some minor work to get it running and later sold it to me. I am the 3rd owner. The car needs a complete interior to be 100%. The door panels are wasted at the bottom and the carpet needs replacing. She does have new seat covers and new mats, Charcoal Grey, so she looks great as is, but would need a few finishing touches to look like new. My reason for selling her is purely financial, with a bad business deal that amounts to a total scam from a friend, I have to sell many things including this awesome classic 62 Impala. This is a true classic, major attention getter and piece of American culture. She is a classic cruiser and a total joy to drive. She runs great and looks incredible! Every time I have her out, people are all smiles and thumbs up!! 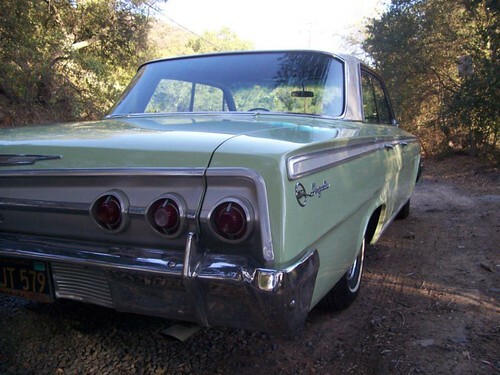 My web site has a page with pictures and my old story on her - Wisdom from the 62 Impala - GregVail.com. That page has been viewed by thousands online over the past few years and my 62 is top of the search engines, world wide. GOOGLE the term '62 Impala' and see. It's top 10 in the entire world. My baby has been a #1 - 62 Impala, online, for years now. I think that's cool! Contact Greg Vail at 714-915-8245 to leave a message or email at gvsaxboy@gmail.com - make sure you put something that doesn't sound like spam in the SUBJECT LINE. BACK TO Wisdom from the 62 Impala - NEW 62 Impala PICs page. Email Greg Vail or 714-915-8245 by phone and leave a message.